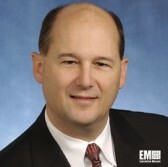 Wayne Lucernoni leads the information technology business of Harris Corp. as president out of the unit’s headquarters in Herndon, Va.
Lucernoni, an inductee into Executive Mosaic’s Wash100 for 2015, first joined the Melbourne, Fla.-based communications and technology contractor in 1990 and previously served as vice president and general manager for Harris’ intelligence, civil and healthcare programs. Lucernoni recently spoke to ExecutiveBiz for an in-depth conversation on the company’s decision to emphasize organic growth for IT services, coming trends in federal healthcare and what the company looks for in partnerships with small businesses. ExecutiveBiz: What areas of the IT services business have you focused on since you became president? Wayne Lucernoni: It’s all about using our core strengths. We started with business development, the front end of customer relationships. We rationalized our pursuit strategy and refocused on making the most of long-term relationships in our core areas: systems and network integration, managed services, healthcare IT, and end-to-end communications that leverage the greater Harris brand. We reinforced our strength in cyber and we didn’t do it in response to the trend. Cyber is an integral part of everything we do — we’ve been cyber experts for decades. We decided to pursue organic growth in our core areas rather than target acquisitions. We’re focused on steady growth through performance and value. We have gotten leaner, like just about everyone else in the industry, and we are in an excellent competitive position. ExecutiveBiz: Could you give us a description of how you’ve factored contract vehicles into the overall business strategy? Wayne Lucernoni: From a contract view perspective, we ramped up our investment in premium positions in government-wide or customer-specific IDIQ vehicles, so we could maintain key relationships and gain competitive advantage through proven past performance. We pursue contract vehicles in our areas of strength, where we can clearly demonstrate value and, therefore, have good prospects of winning business. Second, we look at contract vehicles that enable us to continue supporting our existing customers or reach new customers where we see potential for growth. The old adage that an IDIQ contract is just a hunting license is true. You spend a lot of money getting the license, but then you have to win the work task order by task order. So we aim to be smarter than that. We are going to put our effort and our pursuit dollars into areas that complement our strengths and help us meet our objectives. ExecutiveBiz: What kind of demand are you seeing in the managed services area? Wayne Lucernoni: We are seeing wide-ranging IT consolidation, which is driving an increase in demand for managed services. Our federal government customers need partners who have deep understanding of the current environment — the top-down enterprise requirements and teams who can help modernize legacy systems effectively and efficiently. They also need managed services to help lead teams to deploy new systems and stay on par with market trends and applications — all of this while lowering costs. Harris supports a managed services program for the Federal Aviation Administration to help two million travellers a day, and Harris IT Services employees are the experts in the field across the U.S. We’ve leveraged that into DHS, which has done a great job integrating their network. We see customers across our portfolio moving toward managed service consolidation, utilizing standardization to drive down costs so they can reinvest in their missions. ExecutiveBiz: What areas of the healthcare market could we see some increased activity this year? Wayne Lucernoni: We will see continued emphasis on the need to integrate and share information more efficiently and effectively, but the emphasis on health-information security — which has always been strong — will only escalate. One of the great challenges in healthcare is to enable the easy sharing of different types of data — diagnostics, prescriptions, patient charting, basic health records, eligibility determinations, payments, etc. — among patients, practitioners and those who process claims. This is true for the civilian and military sides of the government and the private sector. There is much work to be done in this area of integration and system interoperability. Given all the press in the last couple of years, the secretary of the VA is really focused on improving patient care, timing, scheduling and integration of data. Harris has a great reputation for, and is honored to serve in, delivering healthcare capabilities at DHS, the National Cancer Institute at HHS, and significantly at the VA.
ExecutiveBiz: What does Harris look for in partnerships with small businesses? Wayne Lucernoni: As we evaluate small business partners, it comes down to two things. One is the character of the leadership and the values it brings. Two is the focus on customers. It is not enough to be certified as small or service disabled; it is about leadership passion, the drive to bring real value or change and the ability to deliver that to customers. We have to trust any partner to share our values and our work ethic. So we need to know that they are committed to top performance, that they operate with good systems and with transparency, and that they will put the interest of the customer first. They don’t have to be perfect, because we consider mentoring to be a big part of the small business partnership, but the basic values have to be there. Secondly, they need to bring real value to our performance and to the customer. We don’t consider small business partnerships to be an exercise in checking a box to get points when the proposals are being evaluated. The small business has to bring some expertise, technology, process, or outstanding group of individuals to the team. We have done fabulous work in supporting small businesses that exhibit Harris’ commitment to excellence. We continue to build our protege network and our industry engagement. We have exceeded our Harris-wide goals and we drive small businesses engagement in every area of our business. We have a select stable of excellent partners that meet our criteria, and we enjoy helping them grow.